Apple's share repurchase program will exit a mandated quiet period on Friday--two days after the company reported earnings--enabling the company to resume buying back shares. Coincidentally, the company's shares were conveniently pushed down toward their lowest price of 2016 today. Apple's shares took a beating following Tuesday's Q2 earnings release, falling from just over $104 to open at $96 on Wednesday. Shares then remained relatively flat until this afternoon, when activist investor Carl Icahn volunteered comments on CNBC noting that he had sold of his shares in the company. Those comments were made during Apple's quiet period, as well as within market hours, resulting in a plunge to nearly $94, very close to the lowest stock price nadir of 2016 seen in early February. Shares improved only slightly in after hours trading. That leaves Apple's shares set up to open tomorrow at a big discount from their year-to-date highs above $110, just as the company is allowed to resume its buyback activity. A year ago, Goldman Sachs portfolio strategist Amanda Sneider advised investors to take advantage of the buyback period following the earnings reports of companies with share repurchase plans, noting that stock prices are typically lower until buybacks are allowed to resume. 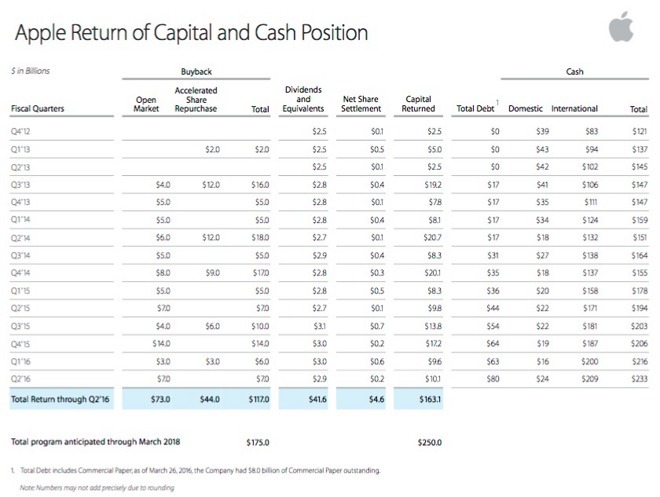 In Apple's fiscal Q2 March quarter, the company spent $7 billion on share buybacks at at average share price of $97.54, again taking advantage of dips in its share price. Those buybacks, as well as $33 billion in previous share buybacks over the previous five quarters all made at average share prices ranging from $109 to $128, all currently look like a poor investment, given the company's current share price and 20/20 hindsight. However, the announcement of another $35 billion allocated for additional buybacks makes it clear that the company fully expects its shares to recover from current doldrums. Some have questioned the wisdom of buybacks given that Apple's shares are currently trading below where they were in the summer of 2014--as well as being below their highest point back in 2012--suggesting that buybacks are not helping. However, the long term outlook for Apple from investor analysts is overwhelmingly bullish, with a one year consensus target price of $120, according to nasdaq.com. If Apple were actually facing a future of slow growth and an actual collapse of demand in China, rather than buying back its own stock it would be scrambling to acquire other companies with an actual, apparent strategy--the way Google has been almost blindly gobbling up its Alphabet soup over the past several years as Android has done little and every one of its hardware efforts have all imploded. While Apple is also making acquisitions (albeit with a discernible strategy), its biggest ongoing acquisition over the past several years has been Apple itself, to the mind-blowing tune of $117 billion. That pace isn't expected to slow down. Instead, Apple says it expects to spend another $58 billion over the next two years. Apple has regularly jumped to buy up billions of dollars worth of its shares during irrational market dips. Last October it was revealed that the company had spent $14 billion on share buybacks in fiscal Q4, after seeing its shares collapse by nearly a third in response to its Q3 earnings report. AppleInsider had anticipated the move, due to the predictability of both traders to skittishly panic and for Apple to take advantage of their irrationality. Back in January 2014, Apple's stock similarly nose-dived after an earnings release, resulting in a stock panic that shaved a (a split adjusted) $10 off of Apple's share price--conditions similar to today. The company responded by scrambling to spend an incredible $18 billion to take advantage of faithless investors' extreme gullibility on behalf of its loyal shareholders, although the bulk of those buybacks ($12 billion) were performed under an ASR rather than in open market orders. Those actions paid off tremendously. Apple bought up over 30 million shares at prices below (a split adjusted) $75, right before the stock again returned to more rational prices.